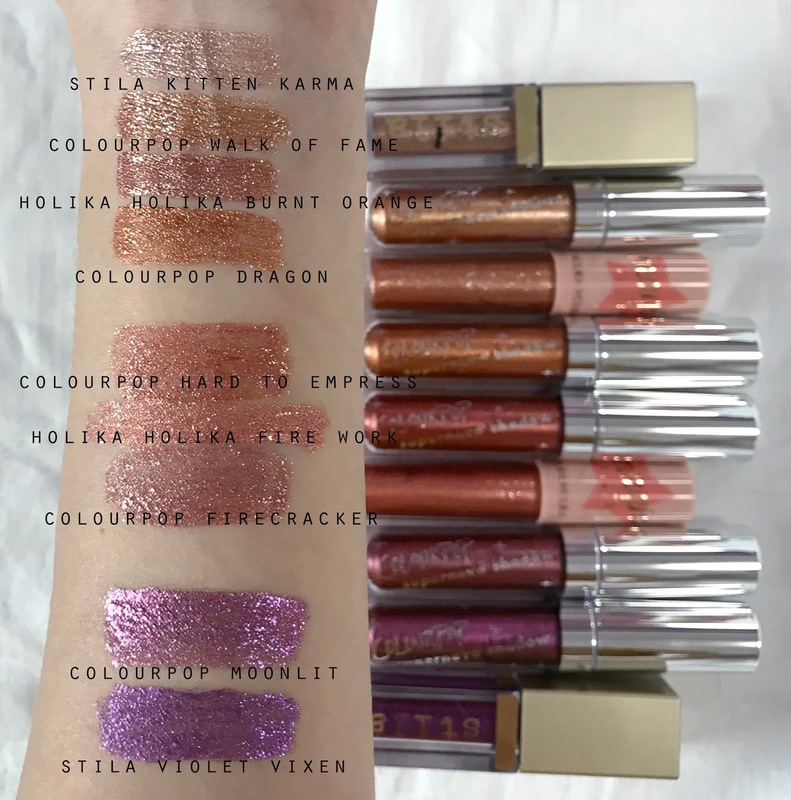 Soooooo, I have been hoping, dreaming and wishing for the longest time for ColourPop to dupe the Stila Magnificent Metals Glitter & Glow liquid eyeshadows and that day has finally arrived! ColourPop calls them Supernova Shadows because they claim to have "bottled the galaxy". These retail for $7 a piece and you get 4.7g/0.17oz of product, which is more than what you get with Stila. The tubes are the same tubes as the No Filter Concealer and it has a standard paddle foot applicator. The tubes have stars printed all around it which is really nice. There are 5 shades at the moment and they are gor-geous. They are water based so water will remove them easily. However, once they dry down, they do not budge. The glitter does transfer and come off if you rub it though. "These high-impact ultra-glittery shadows have a metallic base, are extremely long-wearing, and can be used as a base, alone, or as a topper." Walk Of Fame: True gold sprinkled with silver glitter. This shade is the most metallic of the lot. It is packed with chunky glitter to give it that extra punch and make it look super foiled. 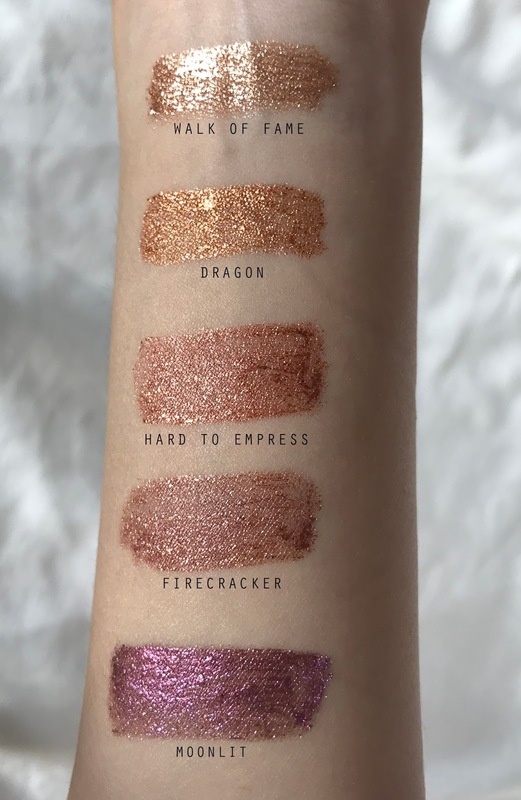 Dragon: Bright copper with pink, teal, silver and gold glitter. I honestly did not notice the multi-colored glitter until I read the description and looked really closely. The colorful glitters are really fine but the ones that standout are the silver and copper ones. This shade applied a little bit more sheer than Walk of Fame. 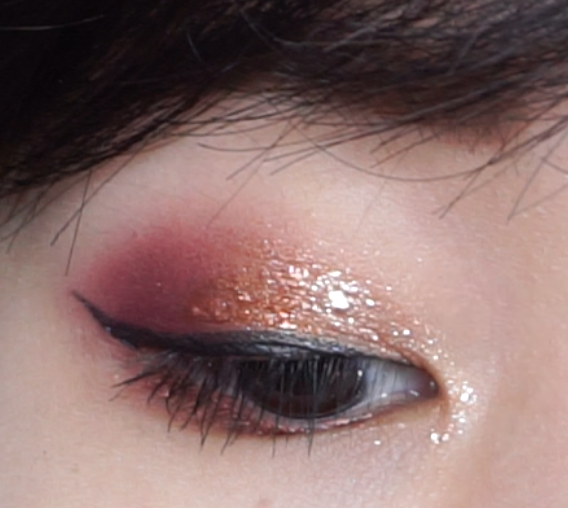 Hard To Empress: Warm red with gold duochrome and silver, gold and copper glitter. I mostly see this as a red with gold glitter but under different angles, you can catch the silver glitter. This shade is a lot more sheer than the previous two. Firecracker: Cool-toned burgundy with gold duochrome and silver, gold and green glitter. Again, this mostly looks like a burgundy with gold glitter. The silver glitter shows up under a different angle. The glitters in here appear as more of a antique gold as compared to Hard to Empress which looks like a brighter yellow gold. It's a very subtle difference. This shade applied sheer as well. Moonlit: Vibrant purple with pink, turquoise and violet glitter. This shade is quite metallic and pigmented but nowhere close to Walk Of Fame. The multi-colored glitters are very obvious with this one. You can apply this directly with the applicator or with a small brush and you can also use them as eyeliners. I like how versatile they are and you can get creative with these. 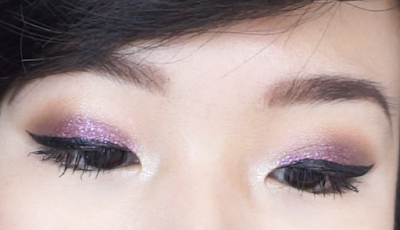 This is one eye look that I did with Dragon on the center of my lids and Hard To Empress on my lower lash line. These dry down pretty fast so you will have to work quickly. I recommend applying a tiny bit and spreading it out so that you can form a thin layer. I also wouldn't recommend applying more than 1 layer. If you put on too much and you do not blend it out in time, it will form chunky patches. You can see what I mean by comparing the left and right eye. One side looks smoother and more blended out while the other has patchy areas and chunks. The chunks will flake off over time if you have a lot of creases on your lids. Stila's Kitten Karma has a much more pigmented base than the ColourPop supernova shadows. It is super metallic and at the same time, it has chunky silver glitters for added sparkle. The Holika Holika one is slightly less pigmented than Stila but more pigmented than ColourPop. It isn't as metallic as Stila but it has that chunky silver glitter for extra sparkle. 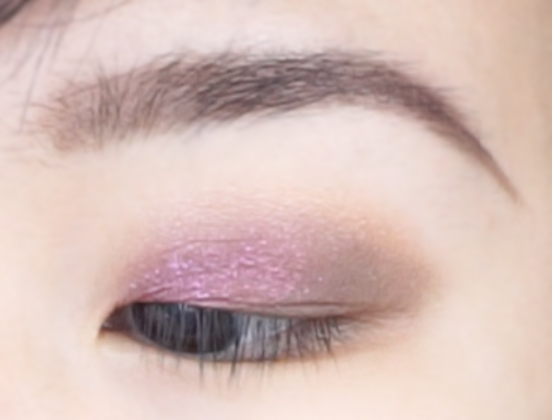 Stila's Violet Vixen and ColourPop's Moonlit are pretty similar in terms of base pigmentation. Moonlit has more metallic-ness to it but it looks much more crusty if left un-blended unlike Stila's which looks very even. Both shades have multi-colored glitter in them. 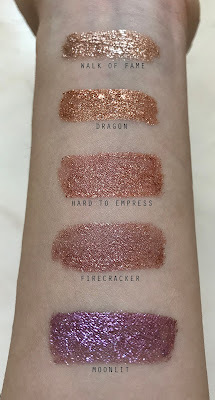 Overall, I really like the shade range that ColourPop has but I think their formula needs more work. It is not on par with the Stila's Glitter & Glow liquid eyeshadows. Even the Holika Holika liquid eyeshadows look better, feel better and perform better. Unfortunately, I can't recommend these at the moment unless they improve on the crusting/chunky issue. If you would like an affordable option to the Stila liquid eyeshadows, I would recommend checking out the Holika Holika eye metal glitters instead.